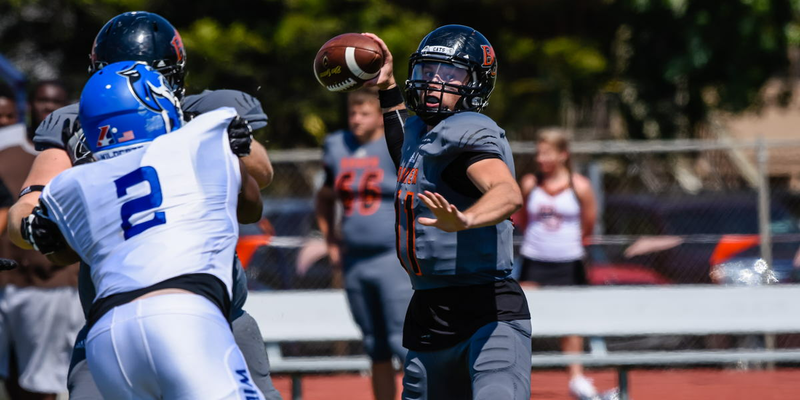 Our top player during the 2016 college season was Baker University quarterback Logan Brettell who led his 14-1 team to the NAIIA FCS championship game and was named NAIA Player of the Year. He completed 406 passes in 582 attempts for 5,073 yards and 52 touchdowns. Brettell led the NAIA in total offense with 5,371 yards. Defensive lineman Josh Kock was named to the AFCA-NAIA All-American second team and was Heart of America Athletic Conference Southern Division Defensive Player of the Year after making 72 tackles, including 17.5 sacks. Defensive back Hayden Jenkins was also a key Baker starter and made 48 tackles. The 8-2 DePauw University squad featured six Delt players who won North Coast Athletic Conference honors. Running back Jason Kirchhoff was a first team choice after rushing for 705 yards, six TDs, and catching 30 passes for 232 yards. Defensive back Brooks Hepp was named to the Division III North Region second team and All-NCAC second team after posting 70 tackles and intercepting a team best six passes. Also named to the All-NCAC second team were defensive back Rocky Leffler (58 tackles, three interceptions); defensive lineman Mike Mitsch (16 stops) and offensive lineman Jeremy Trudell. Other DePauw standouts included offensive lineman Cody Campbell (All-NCAC honorable mention); receiver Ian Good (second with 66 receptions for 612 yards, four TDs); defensive lineman Nathan Orrison (25 tackles, including 9.5 sacks and 13.5 for losses); receiver Benjamin Wilson (18 catches for 245 yards, three scores); receiver Nolan Ayres (nine catches for 130 yards, three TDs); linebacker Zach Williams (17 tackles) and back Brendan Connelly (16 stops). The 8-1 Wabash team also had Delt players earning All-NCAC honors. Linebacker Connor Ludwig was an All-NCAC first teamer who led with 78 tackles, 10.5 for losses of 59 yards and six sacks. He also forced six fumbles ((second in the NAIA) and recovered three Defensive end Ethan Buresh was on the All-NCAC third team and had 43 tackles, including 16.5 for losses. Offensive lineman Kyle McAtee was on the All-NCAC second team and defensive tackle Brient Hicks (29 tackles, six for losses) received All-NCAC honorable mention. Other Wabash players included running back Bobby Blum (101 rushing yards, two TDs), defensive back Jeff Dyke (seven starts, 19 tackles), wide receiver Ja’von Langley and back Kyle Stroh. Members of the 9-4 Idaho Vandals squad (which played in the Famous Idaho Potato Bowl) were fullback Brady Strodtbeck and defensive back Jack Tate. Defensive star Ayo Oyesanya of Westminster was named Most Valuable Lineman and All-UMAC first teamer after making 51 tackles, including a UMAC best 15.5 for losses. Two Kenyon players had good seasons. Kicker/punter Szabi Simo had 42 punts for a 40.5 average and kicked of 42 times for a 54.7 average. He also booted six field goals and became the school’s career leader with 72 extra points. 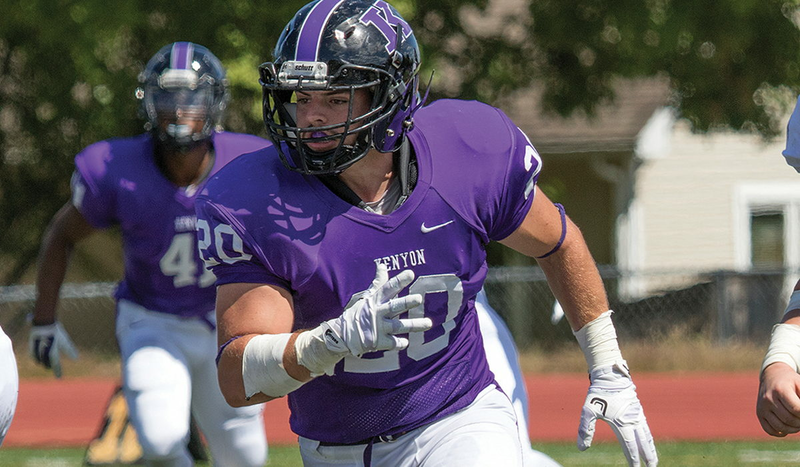 Linebacker Saxon Justice led the Kenyon squad with 98 tackles. Lawrence offensive lineman Jackson Straughan led a group of nine Delt players and was named to the All-Midwest Conference second team. Trevor Spina was the top receiver with 32 catches for 345 yards and two TDs. Quarterback Ryan Butterfield ran for 301 yards and three TDs on 61 carries. He also hit 36 passes in 84 attempts for 345 yards and three scores. Other key Lawrence players were receiver Cole Erickson (10 catches for 130 yards, two TDs); linebacker Jacob Lueck (14 stops); plus backs Wes Hetcher (32 tackles) and Nick Ulloa (25 tackles). Two Delts saw action again in the National Football League in 2016. Deep snapper Tanner Purdum (Baker University, 2007) played in every game for the New York Jets in his seventh season. Kicker Randy Bullock (Texas A&M, 2012) kicked for the New York Giants in the first game and later saw action for the Pittsburgh Steelers. Late in the season, he joined the Cincinnati Bengals for several games and earned a contract for the next two seasons. In the week before the 2017 Super Bowl, former NFL 15 year safety and Fox television analyst John Lynch (Stanford University, 1993) was signed as general manager by the San Francisco 49ers.